Vartest is proud to have attended the 11th Bi-Annual Eurosatory International Defense & Security trade exhibition from June 11 to June 15. As specialists in third-party accredited testing of military products, Vartest’s attendance provided additional input to keep us abreast of new technological and market developments in the worldwide defense industry. 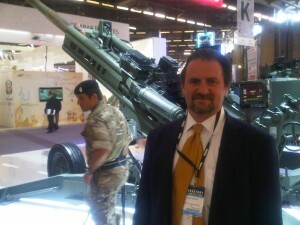 Held in the Paris-Nord Villepinte Exhibition Center in Paris, France since 2002, Eurosatory is considered “the world’s largest land warfare trade show”; this year’s conference, according to Eurosatory’s official website, boasted 1,433 exhibitions from 53 countries, 155 delegations, 684 journalists, and over 53,000 other visitors. So named because it was originally held by the French Army Experimental Unit in the Satory Military Camp near Versailles, the exhibition steadily grew from its inception. In 1991, its organization was transferred to the newly-formed French Land Defense Manufacturer’s Association, or GICAT (Groupement des Industries Françaises de Defense Terrestre). 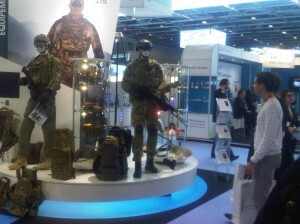 The first formal Eurosatory exhibition was held the following year, in 1992. 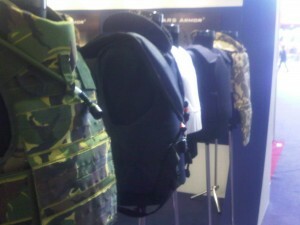 Tactical vest display. Vartest tests similar materials for qualities such as coverage, durability, and thermal protective performance. As defense budgets continue to shrink worldwide, it becomes ever more vital to ensure that current equipment is tested and functional. Vartest provides fabric and textile testing services for a wide variety of defense and security providers, using its ISO17025 quality system to provide trusted, independent third-party test reports which support bids, solicitations, and ongoing programs. Our presence at Eurosatory demonstrates that, regardless of economic climate, we will continue to offer prompt, accurate testing to ensure that all defense products meet or exceed standards of excellence.